Designation: Department of Food Science and Technology, Technical University of Kenya. List of Author(s): Nduti NN, Mwangi AW, Njeru PN. Citation: Nduti NN, Mwangi AW, Njeru PN (2018) Experimental Analogues of Iron, Manganese and Rheology in Yoghurt with Moringa Extract. Int J Food Biosci Vol: 1, Issu: 1 (60-65). Copyright: © 2018 Nduti NN. This is an open-access article distributed under the terms of the Creative Commons Attribution License, which permits unrestricted use, distribution, and reproduction in any medium, provided the original author and source are credited. Several health benefits of Moringa Oleifera commonly known as ‘drum-stick’ tree have been researched and documented. As a result of this, Moringa oleifera leaves extract incorporation and fortification has been carried out in foods such as yoghurt to generate a functional food that advances human health and prosperity. However, information on its utilization especially in yoghurt and its effects in micronutrients during fermentation remains scanty. The main objective of this study was to establish the effect of Moringa Oleifera leaves extract on the utilization of iron and manganese by starter cultures during yoghurt development. The resultant rheological properties of the developed yoghurt and the resultant total Lactobacillus and Streptococcus counts which constitute the yoghurt starter culture as well as morphological characteristics were also explored. To achieve this, Moringa oleifera leaves extract of varying concentrations were added in milk during yoghurt development. Total manganese and iron were later determined spectrophotometrically, rheological properties were recorded taking into account the firmness, cohesiveness and consistency and lastly cell culture and gram staining was used to establish cell morphology. The results showed that cocci shaped Streptococcus thermophiles counts increased significantly with increase in the Moringa Oleifera leaves extract concentration while Lactobacillus bulgaricus growth was inhibited by Moringa oleifera leaves extract. 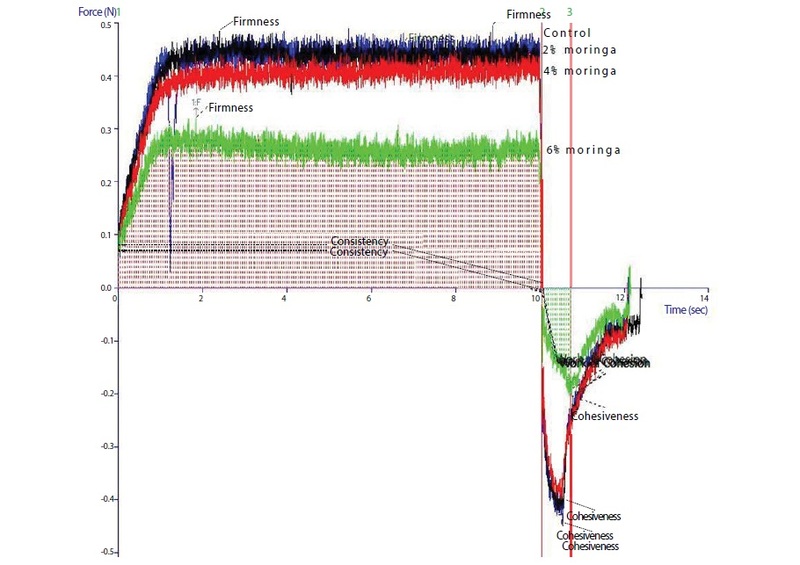 The firmness and consistency of yoghurt decreased significantly with increase in Moringa oleifera leaves extract concentration while cohesiveness increased slightly during yoghurt development. Moringa oleifera leaves extract, Yoghurt, Streptococcus, Lactobacillus, Iron, Manganese, Rheology. Moringa oleifera (Mo), otherwise referred to as drumstick tree, belong to family moringaceae and has a plethora of health benefits . The importance of Mo extracts in nutrition and it proximate composition from various part has been thoroughly reviewed . Its composition of phytochemicals including stigma sterol, sitosterol and Kampesterol, known for stimulating hormones synthesis makes Mo extracts good for lactating mothers and treatment of malnutrition in children under 3 years . Minerals constituents of Mo extracts is more than several commonly known staple foods in the world. Specifically, Iron, calcium and potassium is reportedly more in Mo extracts than Milk . Thus, it has been utilized by mixing with other food products that range from soft beverages to fermented foods . In the events that Mo extracts have to be utilized in it 100% composition, there is low acceptability in some consumers for example children due to it slight bitter taste . Thus the customary is blending with other foods to hide back the bitter taste . While studies have shown Mo richness in nutrients is crowded this has been at utilization. Moreover, the effect of Mo extracts during food production processes is albeit gray. For example, while reviews have stated that 8 ounces of milk may provide 300-400 mg of calcium in comparison to 4000 mg Moringa powder  it would be therefore logical to assume that 16 ounces of both Mo extracts powder and milk would provide approximately 4400 mg . Majority of studies have taken this to be true [1-6]. In addition, different food products face different treatment during processing that includes heat treatment, enzymatic reaction, hydrolysis, dehydration, fermentation among others. Overall benefits and composition of nutrients after Mo extracts addition in food products during some treatments have been keenly investigated. For example, boiling has minimal if any effect on overall mineral contents . Drying may concentrate the contents of minerals as opposed to hydrolysis . The enzymatic processes are complex . They will partly get involved in almost all the biochemical changes . 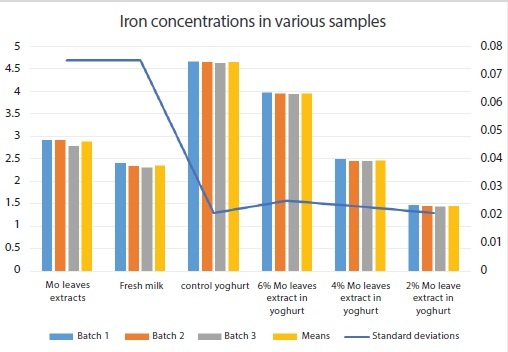 This study dwelt in what happens to the levels of micronutrients specifically iron and manganese when Mo leaves extract is added during yoghurt formation. Yoghurt is made by fermenting milk which has under gone some heat treatment in controlled conditions . The basic starter culture during yoghurt formation is Lactobacillus dubreckii ssp bulgaricus and Streptococcus thermophilus in the ratio of 1:1 [13,14]. Lactobacillus bulgaricus are gram positive cells which are rod shaped and retain safranin dye after gram staining . They are mostly associated with probiotic ability in yogurt [13,14]. This is thought mainly due to their thick peptidoglycan cell wall perhaps that enhance the efficacy of probiotic activities for this microorganism . On the other hand, Streptococcus thermophilus is a gram negative microorganism that is a cocci . This organism is a complete opposite of Lactobacillus bulgaricus in gram staining test . The two microorganisms complement each other during the process of yoghurt formation. The sensoric, nutritional and probiotics properties of yoghurt makes it superior to other milk fermented products . For that matter stability of these properties throughout the process is essential. Basically a good yoghurt rather is determined by the level of pH, rheological properties, and total viable counts of the two associated microorganisms [13,14]. Apart from these yoghurts that are rich in proximate composition, essential minerals and vitamins is far much better citing the fact that yoghurt is considered a complete food product . The range of pH should range from 4 to 5. Rheological properties of interest in yoghurt are firmness and consistencies. While the total viable counts for the two microorganisms which are measured in colony forming units per ml (cfu/mL) range from 108 to 109 cfu/mL . These characteristics for a good yoghurt are largely influenced by quality of raw milk, health condition of starter culture, fermentation process and other ingredients. . Processors have utilized several ingredients to achieve various results for the resultant yoghurt. These includes, viscosity enhancers for example corn starch, probiotic cells, food colors, sweeteners e.g. sucrose (table sugar) and most recently ingredients for health wellness for example Mo leaves extracts [17-20]. Effect on the good characteristics of yoghurt for a number of the ingredients have been studied. Mo leaves extract which has been used as one of ingredients in to enrich yoghurt, has high amounts of Vitamins, minerals and contains all the essential amino acids in good proportion  and has been known for long time as an important nutritional supplement with a variety of medicinal properties . The leaves extract is active against both Gram positive and gram-negative bacteria such as Bacillus cereus, Vibrio cholerae, Staphylococcus aureus, Escherichia coli, Pseudomonas aeuroginosa liable to cause food borne illnesses and food spoilage . It also contains ptergyospermin and other related compounds such as isothiocyanates that have antifungal and antibiotic properties . Raw bovine milk was collected from Dagoretti at the outskirt of Nairobi city. Hot plate was used for pasteurization of the raw milk and a thermometer used to establish the heat levels during pasteurization. On the other hand, yoghurt starter culture was used for inoculation purposes to achieve fermentation. Mo leaves extract for yoghurt preparation: 10 gm of Mo leaves extract powder was weighed and placed in a 500 mL conical flask in which 200 mL of distilled water was added. The mixture was kept in a 37 °C water bath for 6 hrs Figure 1 (A), with constant agitation at 30 mins intervals using a glass rod then filtered and refrigerated for further analysis Figure 1 (B, C). Procedure showing Mo leaves extract powder preparation A-C in that order. Figure 1: Procedure showing Mo leaves extract powder preparation A-C in that order. Preparation of yoghurt: To prepare yoghurt 500 mL of raw milk was placed in four sterile glass jars, Mo leaves extract was then added at concentrations of 2%, 4%, 6%. A control contained Zero Mo leaves extract. Ten grams of SMP was added in each sample in order to adjust the total solids. The samples were then homogenized, and pasteurization carried out on a hot plate at 84 °C for 15 mins after which the milk was cooled to 45 °C. Starter cultures was thereafter inoculated, and incubation carried out in a water bath at 45 °C for 6 hrs. After which the samples were cooled below 10 °C to stop fermentation and stored under refrigeration until further analysis. 500 mL of Mo leaves extract in a glass beaker and 20 mL of Aqua regia (mixture of conc. HNO3 and conc. HCL in the ratio of 1:3) was mixed thoroughly. The mixture was concentrated to 10 mL by evaporation on a hot plate. Then 1 mL of hydrogen peroxide was added drop wise to the mixture in order to digest the organic matter and to clarify the solution which was then filtered into a volumetric flask using an ash less filter paper. The residue was washed 3 times using hot distilled water to complete the extraction. Crucibles were first washed with distilled water then rinsed with aqua regia 20 mL of each sample were put in the crucibles and the crucibles properly labeled respectively. The samples were put in a dry oven at 140 °C for evaporation and to avoid charring. After evaporation 10 mL of aqua regia were added into the respective samples and the mixtures covered with glass covers and further heating on a hot plate carried out until the brown fumes due to nitric acid disappear. To clarify the respective sample solutions 1 mL of Hydrogen peroxide was added drop wise while heating was taking place. The respective sample solutions were filtered into different volumetric flasks. Three portions of hot distilled water were used to complete the extraction by washing the residue obtained from the respective sample digestions. The volumetric flasks were then topped up to the mark. This was determined after sample digestion and clarification. Spectrophotometric technique where SPECTRAA.10 MEMR/MGD/HQS/LABEQUIP/12 spectrophotometers was used. First a standard curve was generated, and the wavelength used was 248.3, Slit width was 0.2, Air acetylene flame and Acetylene flow of 1.5 liters per minute. Results were read in part per million. The yoghurt varied in terms of color and texture in relation to Mo leaves extract content present according to the Figure 2. There was no difference in morphology of the colonies of Streptococcus thermophilus Figure 3 There was no detection of Lactobacillus bulgaricus after Mo leaves extract addition. Mo leaves extracts influenced iron and manganese utilization by the starter culture as shown in Figure 6. In addition, there was no detection of manganese after Mo leaves extract addition during yoghurt development as shown in (Figure 4 and Table 1). A, B, C, D shows yoghurt with 0%, 2%, 4% and 6% in that order. Figure 2: A, B, C, D shows yoghurt with 0%, 2%, 4% and 6% in that order. A, B, C Microscopy of Streptococcus thermophilus in 0% and 6% MO extract in yoghurt as compared to lactobacillus dubreckii ssp bulgaricus in 0% MO. Figure 3: A, B, C Microscopy of Streptococcus thermophilus in 0% and 6% MO extract in yoghurt as compared to lactobacillus dubreckii ssp bulgaricus in 0% MO. Levels of Iron in the tested experimental samples. Left hand scales shows concentration in part per million while right hand scale shows standard deviation. Figure 4: Levels of Iron in the tested experimental samples. Left hand scales shows concentration in part per million while right hand scale shows standard deviation. Table 1: Shows means for Fe (iron) and Mn (manganese) in various samples. N/D and SD means not detected and standard deviation respectively. Addition of Mo leaves extract did reduce the firmness and consistency while it improved cohesiveness as shown by (Table 2 and Figure 5). Table 2: Shows texture profile analysis. Shows The Computer observed Texture Profile Analysis. Figure 5: Shows The Computer observed Texture Profile Analysis. In general Streptococcus thermophilus were slightly inhibited by Mo leaves extract with lactobacillus completely inhibited by the introduction of the Mo leaves extract. The gram stain confirmed the presence of Streptococcus thermophilus in 0% and 6% Mo leaves extract in yoghurt. And only 0% Mo leaves extract in yoghurt confirmed presence of Lactobacillus dubreckii ssp bulgaricus after gram staining (Figure 6 and Table 3). Shows the Lactobacillus dubreckii ssp bulgaricus in 0% MO leaves extract in yoghurt while B and C shows Streptococcus thermophilus in 6% and 0% MO leaves extract in yoghurt. Figure 6: Shows the Lactobacillus dubreckii ssp bulgaricus in 0% MO leaves extract in yoghurt while B and C shows Streptococcus thermophilus in 6% and 0% MO leaves extract in yoghurt. Table 3: Streptococcus thermophilus counts and Lactobacillus dubreckii ssp bulgaricus counts in various MO leaves extract concentrations. TNTC- uncountable, TLTC- low count, N/G no growth. The results show clear evidence of enhanced utilization of iron and manganese by Mo leaves extract in yoghurt. Iron is essential in a variety of microorganisms including starter cultures as it is involved in a wide range of metabolic processes. Manganese on the other hand is a required co factor for all forms of life . The starter cultures may have utilized iron in the cellular metabolism and oxygen transport as well as Manganese for structure and activation of enzymes resulting to growth . Rheological properties of a product significantly influence the acceptance and the consumer purchase intention, thus is an important factor that should be controlled during yoghurt development process. The most frequent defects related to the rheological properties of the yoghurt that may lead to consumer rejection are variations in apparent viscosity and syneresis. Rheological properties may vary due to variations in milk composition, changes in processing, incubation and storage conditions . The high level of firmness in the control yoghurt may have been due to high total solids content in the control yoghurt, presence of polysaccharides and high ability of water binding . It is possible that Mo leaves may have affected the water binders thus decreasing the firmness in the subsequent yoghurt . The high degree of proteolysis by the increased number of starter cultures may be attributed to low cohesiveness and consistency in samples containing Mo leaves extract . In addition, this research found that upon addition of Mo leaves extract at certain concentrations, Streptococcus thermophilus counts increased significantly while Lactobacillus dubreckii ssp bulgaricus was inhibited. This may be due to the fact that too much formic acid was produced by the rapidly growing Streptococcus thermophilus that suppressed the growth of Lactobacillus dubreckii ssp bulgaricus . Another factor that may have contributed to Lactobacillus dubreckii ssp bulgaricus inhibition could be due to the fact that the leaf extracts contain antioxidants and antimicrobial properties due to the presence of phytochemicals such as alkaloids, terpanoids, quinolones, flavonoids, saponins and tannins that are active against both gram positive and gram negative bacteria . On the other hand, Mo leaves extract contains all the amino acids in good proportion therefore Streptococcus thermophilus was able to utilize these amino acids present in the Mo extract thereby enhancing its growth . This research revealed Mo leaves extract enhanced significant utilization of iron and Manganese present by starter cultures during yoghurt development. At the same time the study concludes that rheological properties of yoghurt and growth of starter cultures cells is greatly affected by Mo leaves extract. Even though Mo leaves extract is a good source of nutrients, limitations exist since Mo leaves extract inhibits Lactobacillus dubreckii ssp bulgaricus depriving humans of its probiotic effect and finally when used in high concentrations, it interferes with the desirable firmness and consistency of yoghurt. Mo leaves extract should therefore be used in small amounts during yoghurt development. KIRD Kenya, Mines and geology department of Kenya and University of Nairobi Chiromo campus microbiology lab, helped in sample analysis. We report no conflict of interest.